The gaming industry is in a weird place right now. With the release of PS4 Pro and the Xbox One X, we received new consoles that exist in the same generation as their brethren. The power of the Xbox One X could easily be touted as “next-gen,” and yet, Microsoft prefers to keep it in this generation. We already know that Sony is planning to release a PS5 in the future. How will the PS5 compete with the Xbox One X, if at all? Is it all about power and 4K, or are there some key features that should be included in Sony’s next generation console? Join us as we look at how Sony is going to put Microsoft in their place with the PS5. They should be proud, though, because the specs on Xbox One X are certainly impressive. Where they should be careful, however, is how they stoke the flames of competition. They’ve poked the bear that is Sony before, and it didn’t go well for them. We all remember the unveiling of the Xbox One and Sony’s excellent rebuttal. Despite this, Phil Spencer still sent some warning shots across Sony’s bow in an interview with Eurogamer. During this interview, he was asked if the $100 price difference between PS4 Pro and Xbox One X concerned him. He doesn’t even acknowledge the PS4 Pro as a competitor! It’s true that Xbox One X does have more power than the Pro, but if it’s not going to compete with Sony’s current lineup, then the only other option is to compete with the PS5. Should Sony be Worried About Xbox One X? Phil Spencer’s comments about the PS4 Pro were certainly more harsh than one would normally expect from corporate banter, but if he truly believes the PS4 Pro isn’t in the same league as the Xbox One X, does that mean Sony should be worried about the gap in hardware while we all wait for the PS5? Since there is a large gap in the hardware, it’s hard not to wonder if Sony is worried about Xbox One X games looking or playing significantly better. I’m not going to go into the detail of what’s embedded into individual contracts with publishing partners. What I would do is cast our minds back to the PS3 generation, where we had on paper more impressive specifications than our competition, and in some areas by quite a considerable margin. Now, that didn’t play out the way we had anticipated it would – and this is nothing to do with co-marketing deals, this is just general developer and publisher dynamics. What happened was that developers, maybe at the behest of publishers, developed up to the lowest common denominator and stopped there. And in very few cases took advantage of the additional horsepower of the PS3. It’s a completely fair comparison. The PS3 was indeed far more powerful than the Xbox 360, and yet, many developers never took the time to give the PS3 version any extra help. There will absolutely be deals with the Xbox One X where extra time and polish will be given to that version, but as of December 2018, we haven’t really seen any gigantic differences between multiplatform games, other than higher resolution on Xbox One X. Ideally, developers will only have to one round of work on the Pro and X versions of their games. The general look and feel will also need to remain the same across the standard Xbox One and PS4 versions of the games. As usual, the consoles will compete based on their games and experiences. While things like graphics and hardware will always be a factor, it will always come down to the games. In this regard, Sony shouldn’t be worried, as their catalog is stronger than it has ever been. While Xbox One X may be more powerful than PS4 Pro on paper, Sony seems content with their standing and their mounting sales. Microsoft will certainly have a lot to fear when PS5 releases. Phil Spencer has set the stage for the coming battle, and it’s going to be a bloody one. Xbox One X does indeed have the power, but it’s missing one key factor: the ability to truly use it. If Xbox One X is going to compete with PS5, it needs to have the separation that only a generation can provide. Right now, everything that releases on Xbox One X has to work on the other Xbox One consoles. Backwards and forwards compatibility is a major feature of the system, after all. While it’s impressive from a consumer standpoint, I believe Microsoft is shooting themselves in the foot with this decision. Without the ability to truly focus and direct the hardware into next generation titles, Xbox One X will always be held back by the weaker consoles in the Xbox Family. It can never have a title exclusive to it, because that title won’t work on Xbox One or the S model. We know that Microsoft is working on a next-generation platform. Xbox One X will be the last member of the current “family of devices.” While the entire concept is codenamed “Project Scarlett,” there are two consoles in development, according to rumors. With two potential consoles on the horizon, it’s clear Microsoft is going to be leaving Xbox One X behind sooner rather than later. The rumored release dates for these are 2020, right about when we expect the PS5. While it’s expected that these new consoles will be fully compatible with Xbox One games, it’s hard not to feel like the Xbox One X is a missing link that should have been saved for the next generation. We’re it given the ability to leverage all of its power towards next gen games, and possibly more time to have even better hardware, it could have been a worthy PS5 opponent. The important thing to remember, is that specs aren’t everything. Sony can and will release a console that puts Xbox One X to shame, but that won’t be enough to crush the competition. We’re going to need specific features and options in place if the PS5 hopes to truly showcase a next generation experience worthy of our hard-earned dollars. The PS4 Pro doesn’t quite hit 4K consistently. It gets really close with a lot of games, but not true 4K. Xbox One X has the upper hand here, but with the right horsepower, Sony can match or exceed that promise. True 4K won’t be a problem, so why not shoot for something even higher? How about 8K? Don’t laugh, there are already working televisions that hit this resolution. They’re about as expensive as a car, but they’re real and the price will inevitably drop to more reasonable levels. Depending on the timeline for the PS5, we could see Sony shooting for 8K support to really wow gamers. It could be a PS4 Pro situation where they utilized checkerboard rendering or something similar to go past 4K and into 6K or higher resolutions. Either way, 4K needs to be locked in for PS5. This is the most requested feature for the PS5. It’s for a good reason: people like to play older titles on the new system. Microsoft has managed to make it work with 360 and now original Xbox games, so Sony needs to match this by offering a similar solution. Currently you can play PS3 titles on PlayStation Now, and you can buy PS2 classics, but nothing that allows you to play your old games completely. Microsoft, on the other hand, let’s you put in your old discs and get a digital download of the game that you can play whenever you want. Something similar for PlayStation owners would be perfect. Sony has probably heard about backwards compatibility non-stop, but something has prevented them from putting in the PS4. It seems like the PS5 will need to be the turning point where we get this feature in some shape or form. Even just PS4 compatibility would go a long way, but the further back we can go, the better. That being said, this will be a next generation console, so everything that comes out on PS5 will not work on the PS4. This will ensure that your games on the PS5 look and feel next-gen.
Sony has always been on the forefront of new and exciting gaming innovations. Their latest success was PlayStation VR, which has been growing and expanding with incredible new games. Just recently, I played Superhot VR and it was a transcendent gaming experience. While VR may not be for everyone, it does represent a new and exciting way to play video games. The PS5 should absolutely continue with VR support, and throw in anything else Sony can come up with. With all of the technology available to us, why stop at a controller and a screen? The Playlink initiative is a perfect example of this innovation at work. Titles like “That’s You!” “Hidden Agenda” and “Knowledge is Power” all use smartphones and an app to play the game. That’s right, experiences for up to six people without the need for that many DualShock 4 controllers! Traditional games can and should exist into the future, but there’s nothing wrong with having options. VR support, or even augmented reality experiences could really give the PS5 an edge over Microsoft’s traditional approach to console gaming. This isn’t even a fully list of exclusives, but just looking at some of the critically acclaimed titles shows the kind of talent that Sony has in their studios. In just a few years, Sony has increased their exclusive library by a large margin. When you add in PlayStation VR, that number gets even higher. If we turn our attention to Xbox One X, that list is a lot smaller. While there have been some indie titles exclusive to Xbox, franchises like Halo, Gears of War, and Forza have been left to carry the torch. Sony is continuing to astound with new and exciting titles on the PS4 and the PS4 Pro, but they will need to keep up this momentum. Microsoft is bound to bite back with some new exclusives as this gap continues to widen. With developers like Guerrilla, Sucker Punch, Insomniac, and Naughty Dog under their belt, I’m confident Sony will continue to lead the pack with exclusive titles on PS5. If you need even more proof, just look at the amount of new I.P we’ve seen on the PS4. It continues to blow my mind that the same developer who created Killzone also brought us Horizon: Zero Dawn. That’s right, Guerrilla Games who have been known exclusively for their work on a first-person shooter franchise, also brought us the exquisite open world action RPG that is Horizon: Zero Dawn. Furthermore, Naughty Dog, is known for their work on Crash Bandicoot back in the day, Jak & Daxter on the PS2, and then Uncharted on the PS3 and PS4. Not only did they manage to cross all of these genres with ease, but they also brought us The Last of Us and the sequel coming to PS4! We’re talking about platformers, globe-trotting action adventures, and apocalyptic horror from the same developer! The most recent example of this flexibility comes from Sucker Punch. Originally they were known for Sly Cooper, but then they did the excellent Infamous series of open world action superhero games. Now, they are working on Ghost of Tsushima which looks like an excellent take on the samurai warrior era. I’m more than confident that these developers will bring the heat with PS5 and offer both sequels and new franchises in equal measure. Even so, these exclusives will be a major part of Sony’s competitive edge into the next generation. It’s no secret that Nintendo has a winner on their hands with the Nintendo Switch console. The ability to play your games on a TV or take them with you is something that many gamers (myself included) have always dreamed of, but never truly had. While there’s clearly a sacrifice that needs to be made in terms of hardware, Nintendo has managed to make the magic happen with the Switch. As it turns out, Sony has considered the same thing, going so far as to file a handled system patent. The PS5 needs to have ultimate power in terms of hardware, so while it’s doubtful that Sony would sacrifice hardware to make it portable, a revamped and re-imagined form of remote play could give us the ability to stream PS5 titles to a portable device of some sort. One thing is certain: people like to play their games on-the-go. It may not be a huge focus, but if Sony were to include some sort of portable element to the PS5, it could give them yet another edge over Microsoft and the Xbox One X. Will Sony Dominate? What do you think? Will Xbox One X stand a chance against the PS5? How can PS5 win big in the next generation? Let us know in the comments! Not really input but this was an extremely biased article even based off the little information you have on the ps5. Damn you happy you bought that awful system 3 times? Still got trash games no matter how much power or how many times you buy it. Wow $1500 on xbox one. Hope you’re not as dissatisfied as the other 29 million people who bought that trash. And the xbox one s is weaker than base ps4 so thats not ps4 pros competitor. Ps4 pro is for people who want the best looking games this gen to look better. Xbox 1 x is to plaster 4k over all its bland homogenous 3rd party releases. I love both platforms..they each offer something unique. I’ve had a ps2, xbox, xbox 360, ps4, and an xbox one x. Right now the One X is killing it..but I think PS5 could really be quite better. It needs native 4k for sure. I really could care less about VR. Ps5 is the future but that’s only because it’s going to be a next-gen, Xbox x is of now the best console ever, when ps5 comes then we wait to see what Xbox has to offer, till then Xbox x most powerful console ever, but the margin between ps4 pro to Xbox x is less a leap. Xbox x has the horsepower bit if developers won’t take advantage of it then what’s the whole point. Are you serious, man? 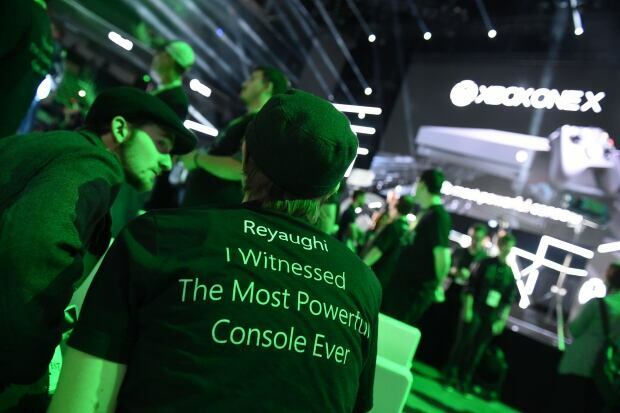 Why you think that Microsoft will not release their next-gen console in the same time with Sony? Xbox is better. PS5 is just trying to compete with xbox because they know they are trash. They say they are coming up with something better. They are just waiting for xbox to update so they can beat them. Well you can’t playstation xbox comes before playstation. What makes Xbox so much better? Is it the games? The features? The Price? Price, service, and if we talk about games – both of consoles have good games. People think that ps4 and the other types of ps4 game are way better then xbox well I say f*** no. Xbox games are more power full then what ever ps4 have in save for xbox is going to work xbox will all ways have some thing in store of ps4 soo.. What I say is, bring it ps4 is trash! Xbox games are more powerful?! Like state of decay and sea of thieves? Yeah those look real powerful next to God of war, horizon zero dawn and Spiderman. Hit xbox up they’ll give a mindless fanboy like you a job! 4. We can all agree we want these things game systems just listen! Not sure your ability to understand the article is any better than your ability to write. Microsoft is calling the XB1X the “best console ever” because it is their next gen console. They have nothing else. Meanwhile Sony could care less. Are they are dominating market share? Yes. Are they are dominating in games/exclusives? Yes. they are dominating in VR? Yes Will they will dominate with the PS5? Yes. It is what it is deal with it.